When we first purchased a house more than ten years ago, we never had any idea on how to deal with the construction phase. We initially bought a house and lot package and we were able to have it on a cheaper price. The reason? The property is not well developed. There are lots of rooms for improvements. That was just a basic 2 bedrooms house, no fancy things. I had an arduous desire to improve it and this is where I first try my hands at working on some renovation ideas, price estimation on materials and labor costs and the best part is sourcing for the best construction workers around that will satisfy my needs. Well, my first few attempts were not successful. Employing unreliable people to work with you in your project is not an easy thing. To say the least, people have the tendency to take advantage of the situation especially for someone like me who still doesn't know the ins and outs of the thing. On a positive note, it was a worthwhile experience! When I moved on to purchase another property in 2005, I already had some basic knowledge on how to push through, although I would say that it is not that perfect yet but I know that I'm moving into a right direction. Apart from being too particular about the prices, I concentrated on sourcing for the best suppliers and laborers who would directly be involved in the construction. Since then, I am much into construction as I never finished introducing various improvements to the house. For a project to be done efficiently and with a certain amount of accuracy according to your specifications, you have to make sure that the workers you're getting are not only skilled enough but owns the right tools for the right project. Some tools are rare and not too many construction workers around are in possession of the right tools and this is where the time table for the project is being delayed. 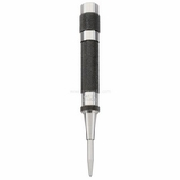 A best example of which is the Starrett 18A Automatic Center Punch. I've seen that one of our home friendly buddies in the house who was involved in the initial phase of the construction was in possession of this tool. He owns a steel shop and fabricates different steel sheets for different types of projects like awnings and gates based on the owners specifications, and he told me that he really tried his best to source for a complete line of reliable tools for his steel shop and this Starrett 18A never puts him down. One of his men even commented that it was a cool tool. He added that sourcing for reliable tools is not so hard as there are some shops available online which could deliver just the right tool for you. I guess he's right. Investing on some reliable tools is important when your goal is to satisfy your client and delivered the best services required on time. This can yield to a long time partnership with your clients and an increase in productivity means an increase in profit.